Most manufacturers these days are extremely familiar with the supply chain concept of “lean,” which centers on minimizing waste. But a new supply chain methodology is climbing the ranks in the list of manufacturing principles, and many experts argue that this new strategy may actually prove more beneficial for some companies than the lean strategy. So, what exactly is this new supply chain principle? Agile supply chains: an alternate strategy. While the lean supply chain certainly offers great benefits for many companies (including reduced costs and minimized waste) this strategy tends to work best when the manufacturer is producing a large volume of products with a consistent level of demand and a small amount of variety. For companies with more unpredictable demand who manufacture a greater variety of goods (including frequent customized goods), an agile supply chain strategy will often be more effective at reducing costs and increasing productivity. For these companies, the volume of goods produced is often lower than those who use the lean principle. Agile supply chains focus on adaptability and flexibility. 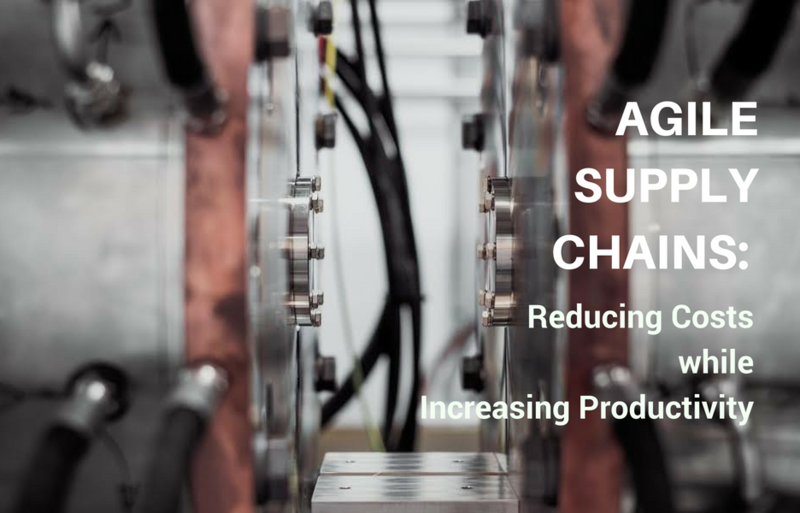 Agile supply chains are able to quickly adapt and react to changes in demand, changes in the economy, and changes in technology and equipment. This is done by using real-time data and information to make decisions about how to proceed with production. This predictive analysis of data means that agile supply chains will be prepared to handle sudden changes in market conditions, demand for customized goods, and other variables by responding immediately, rather than responding retroactively. This process also allows manufacturers to eliminate excess inventory without needing to worry about product shortages. This is because agile supply chains are designed to help manufacturers produce the correct amount of goods on a day-to-day basis, rather than relying on quarterly, monthly, or yearly demand forecasts. Market conditions are becoming increasingly turbulent and unpredictable, meaning that these demand forecasts are often incorrect, leading to either shortages or surpluses of manufactured goods. This is just one problem that an agile supply chain can help to solve. How can an organization become agile? Collect as much real-time data as you can. This includes data about the economy, consumer demand, supplier information, and inventory insights. Focus on forming a communicative and trusting relationship between all players in the supply chain, from suppliers to manufacturers to the end customer. Ensure that you will have access to supplies and raw materials no matter what. This may require forming relationships with multiple suppliers. If demand suddenly skyrockets, you want to feel confident that you will be able to require all of the materials you need for production. Shorten your order-to-delivery time as much as possible, as well as the time it takes for you to respond to changes in consumer demand. The smaller you can make this timeframe, the more successful your agile supply chain will be. Agile supply chains demand quick-thinking and flexibility, but they provide valuable benefits. For many organizations, the ideal supply chain incorporates ideas from both lean and agile strategies. While shifting to a more agile supply chain may prove challenging for some companies at the beginning, it’s a surefire way to drastically reduce your costs while boosting your productivity. OmegaOne is proud to implement agile supply chain strategies in order to meet demand for custom stainless steel fittings. Contact us today to learn more.